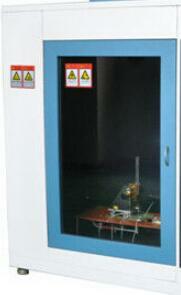 Needle Flame Test Chamber is used to test the resistance of fire caused by an interior fault such as leakage current in cable & wire and the like. It meets the requirements of Chinese GB4706.1, GB5169.5, and IEC60695-2-2 and IEC61347-1 standards. a. All stainless steel and brass constructions. b.Burner can be ignited automatically. c.Temperature and test time display by digital meters. d.A big window in the door makes your viewing more convenient.